Digital Signature Certificate @ Never Before Rates! Fill Below Form & Get DSC @ Never Before Rates!!! Anmol Technomart Pvt Ltd is one step solution for your requirement to participate in tenders. We are providing “SIFY” (Safe Scrypt) digital signature certificate to participate in Online tenders. By Having Qualified manpower we provide timely, efficient services with technical support. 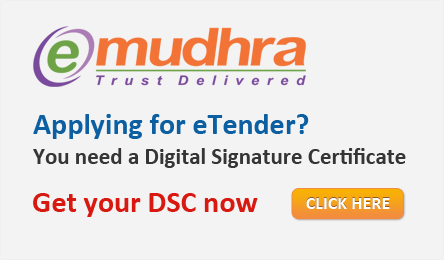 Class 3 digital signature certificate is requires participate in online tenders Or Online auctions across India. This digital signature certificate will confirm your identity to the particular authority where are going to bid online. By having class 3 digital signature certificate you can participate in any kind of e-tenders or e-auctions by sitting at one place. We Are Providing Technical / Non Technical Support for E-Tenders & Tenders of Governments, Semi-Governments, Corporate Sector, Private sector, PSUs, NGOs, States, City & Local Bodies. Get renewal notification before 30 days. For further details, Email us at sales@tradereader.com or Call Us on +91 99090 22166 / +91 99090 11030.